The research for this post was prompted by a question at a recent Garden Club outing - 'which direction do bower birds construct their nests'? Of the people there, no unequivocal answer was forthcoming. So here goes folks! Bowerbirds live mainly along a 250 kilometre wide fringe along the eastern coastline from Victoria through New South Wales and up into southern Queensland. There is also another 500 kilometre strip in northern Queensland. The break between these areas is mainly due to urbanisation and lack of suitable forest conditions. There are four Bowerbirds found in New South Wales - Regent Bowerbirds, Satin Bowerbirds, Spotted Bowerbirds and Green Catbirds. Their head, back and flight feathers of the male are coloured in a rich golden-yellow with basically the remainder being black with a purple sheen. Its forehead is sometimes tinted crimson and has bright yellow eyes. These male bowerbirds moult into their plumage when 4 years old. 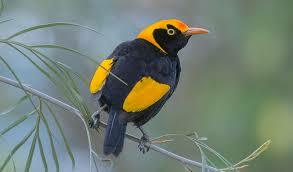 Until then he is very like a female Regent Bowerbird. The female is coloured in shades of dull brown, olive-brown or yellow brown on the upper parts of her body and pale buff with brown mottling underneath. Both male and female Satin Bowerbirds have bright lilac-blue eyes, but their similarities end there! The mature male is about 30 centimetres long, with his plumage black with a glossy purple-blue sheen. He comes into his adult plumage during his seventh year, until then his plumage resembles that of the female. She is slightly smaller and is coloured green, grey-green, dusky brown and dark brown. Her underbody is buff to cream, marked with dark olive-grey to dusky grey crescents. 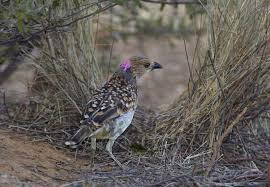 Both the male and female Spotted Bowerbirds have a bottled brown appearance with a bar of lilac on the back of their necks. The mottled plumage ranges from fawn-brown with dark spots on the neck to a dusky-brown or black with buff spots on the back and wings. 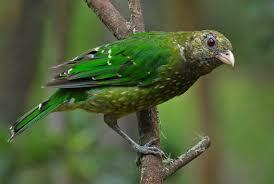 The Green Catbird, another member of the Bowerbird family, gets its name from its cat-like wailing call. Males and females are various shades of green, flecked with black on the head and face, white on the nape, neck and wing tips - their eyes are red. 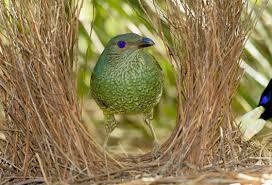 With the exception of Green Catbirds (who do not construct bowers) Bowerbirds build elaborate 'avenue bowers' comprised of two walls of twigs leading to a display court where he 'struts his stuff' performing displays for females. He decorates this display court with trinkets to attract females. The actual bower is 'painted' with a mixture of saliva and crushed leaves, grasses etc. A general rule of thumb is that he paints in a colour similar to his own plumage - for the Regent Bowerbird, yellow; Satin Bowerbird, charcoal; Spotted Bowerbird, red/brown. Trinkets for the display court vary as well - the Regent Bowerbird decorates with red black/yellow brown; Satin Bowerbird with blue; Spotted Bowerbird with white/pale green and the Green catbirds may decorate a cleared area with some leaf material. To show this display court off to best advantage, the bower is usually constructed with a north-south orientation. So I guess that answers the question asked at the outing! However, in closed-canopy forests, bowers are built near canopy gaps so that light reaching the forest floor illuminates the male and his wonderful bower. Australian Museum have a wonderful article on the Satin Bowerbird (which is usually the most common Bowerbird on the Coffs Coast). There are also some great illustrations on what-when-how about how Satin Bowerbirds construct their bowers.